A good user persona template helps you get a full idea of who your target market is—and how your design, product, or services can help them. Source: Are personas ruining your product? Once you have a good idea of who your user is, you’ll be able to tailor your design exactly to their needs. While you can create a product without one, it’s difficult. It’s like driving to a destination without a map or GPS. Sure, you could probablymake it there, but you’re much more likely to do so if you knew the directions. That’s why we want to break down what exactly a user persona template is and give you the exact elements you need to include in it—with plenty of examples, of course. What is a user persona template? A user persona is a representation of your target user. And once you have a fleshed out user persona, you can use it to guide all of your design decisions. Ultimately, this helps you create products and designs that sell themselves, because they address your target user’s exact needs. This comes with one big caveat, though: Creating a user persona is not an excuse to avoid talking to actual users. Creating a user persona is not an excuse to avoid talking to actual users. The biggest mistake designers can make when crafting their user personas is making the entire thing up—and it’s a mistake that happens often. “From my experience working with several teams and many digital products, I’ve learned that not everyone likes doing user research. The reason might be that they ‘just know’ what the customer wants, they’re frightened of what they might find out, or they just don’t see the value. At the heart of the problem is the idea that many user personas create a host of unchallenged assumptions that designers will take as fact about their users. And when you don’t challenge your assumptions, you miss out on who your users are and what they want from your product. How do we solve the problem of “fake” user personas? You talk to your customers. That means spending the majority of your time conducting smart user research. “We don’t just interview 100 people and then start designing. We take that knowledge and condense it down into a picture of our ideal customer. By creating your user personas this way, you shift from user personas filled with unchallenged assumptions with one that is grounded in reality. (And you can use InVision Freehand to create the template). Try Freehand, the fast, flexible new way to collaborate in real time. With that, let’s take a look at the bare essentials you need to create your user persona template—with plenty of examples. Below are the 5 essentials to a user persona template that will help you crush your next design project. Your user persona template should always include an area for basic information about your user. This is going to be the basic demographic data about your user, along with a short bio snippet. The goal is to give you a quick snapshot of who they are. Of course you aren’t trying to capture the information about absolutely every one of your users here. That’d be impossible! You’re just trying to put together an archetypeof a typical user. That’s why you should also include an overview for the user in the basic information section as well, sort of like a nickname. How would you describe your user? Whatever works as long as it captures your specific archetype. Images can tell a bigger stories than any amount of copy can. Once you give your persona a face, you humanize them. This gives you a much better idea about how your design and products can impact this person’s life. Try to capture your user’s age, gender, and personality in the picture. Are they an entrepreneur sitting in a coffee shop working on their laptop? Or are they more of a suit-and-tie C-Suite exec? One great place to find free images for your user persona is Unsplash. You can simply search “persona” or descriptors fitting your user persona and find the images you need. Describing or showing your user persona’s personality can really help flesh out who your user persona is and guide your design decisions for them. Myers-Briggs. This is a great opportunity to include information about your persona’s Myers-Briggs personality type, giving you insight about how they view the world. Descriptions. You can even just give a description of how they are in real life. Are they funny? Sarcastic? Ambitious? What kind of personality does your user have? X-Y Axis. Where are they on the range of extroverted and introverted? Thrifty or luxury? Urban or rural? Simple bullet points can suffice, or if you want, you can use elements like the slider in the example above. This section is where you put all of your user’s goals and motivations related to your product. What is motivating your user persona right now? What could possibly, realistically, drive them to your product? By finding out their goals, you can answer these questions and find out exactly how your design could service them. Your target users’ pain points should influence your design decisions more than anything else. That’s because they give you an indication of how exactly your product can help them. And, like the goals section, this should be related to your product. What are they struggling with? What frustrates them to no end? How is your product or service going to help solve these issues for them? By finding their fears and frustrations, you’ll be able to start designing the answers for them. Of course, there are plenty of extra things you can include in your user persona template. As long as it’s in line with your goals and helps you find out exactly who you’re designing for, feel free to include it in your template. Channels. These include social media platforms, websites, and even browsers your user uses on their regular day-to-day. Quotations. A great opportunity to draw from the research you did (or should have already done). Include an actual quote from someone you talked to. This can give you a good idea of what they’re looking for in a product, and how you can account for it in the design. Favorite brands. What brands do they love? What are they buying regularly? Knowing the brands your user typically turns to can greatly influence how you design your product. Favorite books, magazines, or blogs. What’s in your user’s media diet? What are the types of things they like to read often? Your user persona is going to be unique to you and your design goals. So don’t worry if your persona is missing an element another business uses. Now that you know exactly what goes into a great user persona, let’s take a look at a few great templates you can use to inspire your next persona. NOTE: You’re going to notice that a few of these personas don’t have all of the essential elements we listed above. In fact, a few of them entirely subvert the essentials—and that’s totally fine. The point is that you create personas that fit your business’s design needs. If it doesn’t conform to what another template says you should do, that’s great! Use the examples below as inspiration for your next user persona. Xtensio offers a great template with seven sections to help you cover your user’s profile. It’s also incredibly intuitive, with tools that allow you to easily adjust the layout of the template, as well as a feature to add other team members to edit the template. Marketing automation company Hubspot has their very own persona template creation tool. It works on a “plug-and-play” model that takes the hassle out of creating your persona. The only downside is you can’t customize the picture. However, there’s an “Add New Section” button that allows you to easily add more elements that you want but aren’t immediately offered. 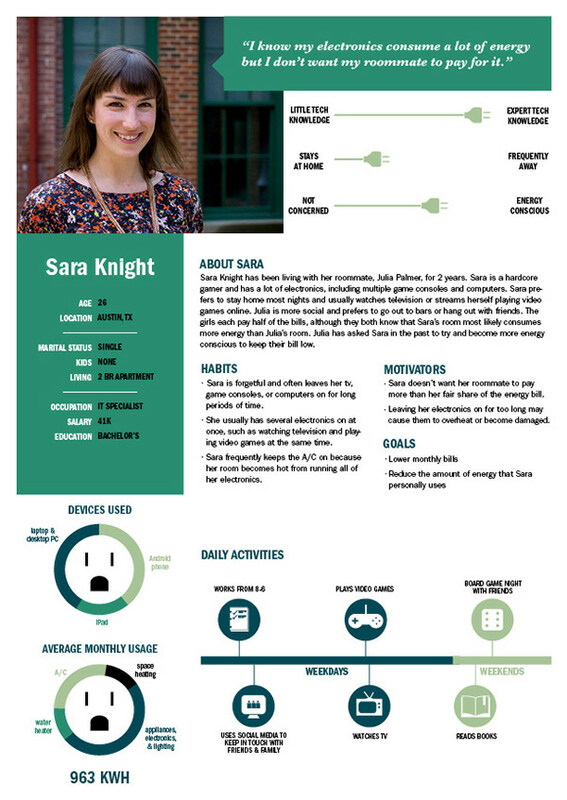 A great user persona template from designer Andrea O. The spartan design integrates the image of the user in with seven elements. Great for giving quick snapshots at who exactly your user is. Mailchimp delightfully subverts expectations of your typical persona. Instead of having neat sections for each of your user’s elements, they just have a single profile with their name and job title. Surrounding the user are words that describe their personality, goals, and struggles. This example leverages typeface as well as copy in order to adequately get across who the user is. Of course, you don’t necessarily even have to have a picture of your user if you can capture them in a creative illustration, as designer Janna Hagan did for Shopify. These trading card-esque user personas both subverts the expectations of what you’d expect from a user persona while providing all the information the designer needs. This user persona template is very unique, as it relies heavily on visuals—rather than copy—to get their user’s personality and interests across. This specific template was created for a developing music platform, which is why elements such as the music usage images for mobile and laptop are included. A very creative way to get across how these users might use their product. Photographer Jason Travis does something unique with these personas and showcases what the user carries with them. This is an entirely visual persona that tells a story of who this person is through the things they own. A very good way to approach a user persona if you’re designing for physical products or if you want to look at your user from an unconventional angle. User personas offer the opportunity for you and your team to really get to know your target user, and they can help inform and guide the design process when you remember to incorporate extensive user research. With so many user persona templates to choose from, it might be hard to decide. But as long as the template fits with your goals, it’s fair game. If you want an easy platform to create your own template, try InVision Freehand. You can collaboratively create personas, mood boards, and more. Tony is a content marketing consultant and freelance writer. His work has been seen in Business Insider, MSNBC, Hootsuite, and GrowthLab.